"Mr. Kiji" is a craftworker who cuts hardwood trees, such as Toshi, Beech and Zelkova, and uses special tools called Rokuro to make trays, bowls, Konkesi etc. 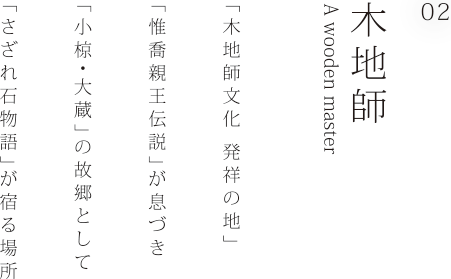 By region It was called "Master of Woodlands, Master of Woodlands, Wooden House". About 1200 years ago from this time, the technique of this 喬 is thought to be a から から from the "principle of winding axis rotation" of the scroll of the Lotus Sutra (Hokkaido), and the technology It is said that it began to tell the family such as "Ogura / Ozura" who was a vassal. "Birthday princess" is born as the first prince of the 55th "Emperor Bunraku" while embarking on the throne without succession to the throne succession, leaving the capital, along with several aides, pagan This is a person who has reached the Ogura Valley in the year of the first year (859) and lived in this place for 19 years till the end of the era (legend). This legend spread among the wooden masters, the wooden masters nationwide, the parents of Nobunaga are "the grandfather of manufacturing", recognizing this Ogura valley as the place of their ancestors, believe It was. Ogura Valley refers to the Rokugamura of "Kimigata, Hikokutani, Minkawa, Kyoko, Kohwadada, Kurobase" in this area, among which the village of "Kimigata-Hikokutani" Culture of Japan "is leaving a lot. There are "Kameruji Temple (Takamatsu Gosho) Kinryuji (Kinrutsuji)" and "Emperor Town Shogun Shrine (Okiki Mikoshi Shinkansha)" that worship the Nobunagori's Prince in the Kimogatabata, and in Hikotani Town There are "Tsutsui Kimonbun-ko (Yokoi Kumon-jo)" and "The Mausoleum of the Nobunaga's Prince (Goryo)", "Kinba Master Memorial Museum", etc. Since that time, as the "master of the wooden master group" I was protecting and supervising the wooden teachers. There are a lot of valuable cultural assets that convey the historical culture of the wooden master in Kimigata village Hikiya. Especially, the designated cultural asset of Shiga Prefecture "Mrs. Mizuki Doko · Mrs. Hunting Book" is a project to visit the wooden master all over the country for a long time to manage the wooden master belonging to his control point It was a record of "Personal Directory", which was created for the purpose of reforming the identity of the wooden master who was also often not mentioned in the nominated buddhist memorandum of the whole country, It is a valuable cultural property that sometimes visits with reference to the ancestral record. As another legend to live in the home of Mr. Kinchi, there is "Sakare stone tale". This is because the vassal "Fujiwara Katsutoshi" who was an aide of Nobunaga's prince found a sabiaong stone when he visited the village of Kuzuna called Kasuga village in Gifu Prefecture, and made it at that time, "My gentleman It was Satoru in the Yachiyo in Chiyoda and became the rock of the stone until the moss' moss. " And this wine poem "My girl" is showing that you are the Nobunaga of the kimono field, so this place originally called "Komatsu field", Kimigayo was written It is said that it became known as "Kimigata" because it is a sacred place. This story is still being told even at "Sazare stone park" in Kasuga village of Gifu prefecture, and that is touched on the tour guide board as well. Currently, this "home of Kinji master" carries out various events and festivals to promote precious historical culture which is the backbone of Japan's "history of manufacturing". Also, in recent years new trends of woodworking culture and woodworking artists have been born, local residents have set up new organizations for cultural promotion, and the trend of new woodworking culture is about to come into existence. Such "modern wooden teachers" at the hometown of the wooden master, not only as a mere woodworking engineer, but also as an antithesis against "environment-conscious society" of mass production and mass consumption, raising the forest, facing the forest , Message from the forest to the future as a practitioner of "environmental recycling-oriented society" that creates affluence with "skill and mind". Why do not you enjoy "time to face the forest and the future" with us?